So, the decision made to start a blog….it was time to embark on the actual process of setting it up & choosing a name for it. However, it appears that everyone and their quirky, vintage, crocheting Aunt has a crafty blog and it was impossible to find an available name that had any relevance whatsoever with what I am (planning) on doing. Therefore, I decided to go with the obscure. Yet, even obscure has pretty much been done. 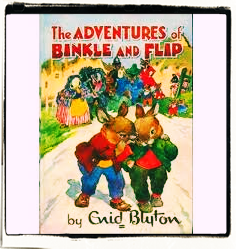 Then, a conversation about favourite fictional characters with T, following yet another episode of Scooby Doo (his is Scooby, mine is Daphne), reminded me of what fantastic (obscure) names some of the characters had from my own childhood, and so I came to Binkle (a very naughty, mischevious bunny rabbit from the Enid Blyton stories ‘Binkle & Flip’), and Bungo (the rather over-enthusiatic & bossy Womble, of Wimbledon Common fame). That’ll do I thought….and so it will…..